Steven Butala: Welcome to the Land Academy show. Entertaining land investment talk I’m Steven Jack Butala. Jill DeWit: And I’m Jill DeWit, broadcasting from gorgeous, sunny, southern California. 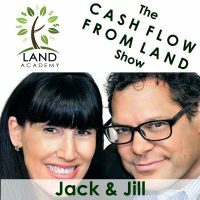 Steven Butala: Today Jill and I talk about the value of meeting in person other like kind land investors. Jill DeWit: Maybe because that’s happening at the end of this week? Steven Butala: You know, I was just thinking there, there’s a bunch of stuff that will never go away with the internet. Like nobody can argue that the internet hasn’t changed just about everything. But there’s a few things I just don’t think will ever change. Jill DeWit: Like human interaction? Steven Butala: I force Jill to watch movies sometimes. Jill DeWit: Yeah, that is true. But this was kind of an interesting movie, it was good. It was the movie where the guy fell in love with his artificial intelligence assistant, basically. Jill DeWit: What’s it … I can’t remember the name of the movie. I’m sure everybody listening right now is yelling it out in the car. And like okay, you know what the movie I’m talking about and it was so interesting that maybe … it was funny he fell in love with it but he couldn’t hug her. And they tried that and that didn’t work. That was kind of a weird part in the movie, but we all know what we’re talking about. Steven Butala: Yeah. We’ll talk about it in a minute. Steven Butala: Before we get into it, let’s take a question posted by one of our members on the landinvestors.com online community, it’s free. Steven Butala: So this is a really good question. And it’s a very advanced question. In this business of option selling or assigning, some people make a whole business out of this. In fact, I’m in the process of recording Land Academy 2.0; Info lots. And I address this in great detail. One of the pivotal reasons that our business model works so well for us and some of our members, most of our members, is that we pay cash for properties. So we go to a seller and say, “We will pay you $15,000, and you and I both know it’s wroth little bit more, but for convenience, for you, we’re gonna write a $15,000 check for this info lot even though it’s worth more. What do you say?” And they say, “Heck yes, how fast can you do it?” And we write the check and we own the property and then we control it and decide what to do. For some people, that’s not their thing. They wanna just say, “Hey, I’ll give you $25,000 for the same lot. It’s gonna take me some time to market it and to … ” I don’t know, find a person or a builder or just basically, market the deal. And so that’s not our game. But there are people who get the good news and say, “You don’t have to come up with any money.” But we just prefer to do it the former way. Jill DeWit: Have I really? Jill DeWit: Oh, my God, that’s funny. You know, I’m not a fan because your heart’s not in it, is part of it. It’s a whole different mindset. When I own it and I paid cash for it, I need to flip it, I’m ready to flip it, I wanna flip it, I wanna sell it quickly and get out from under it. You know? I’m excited and hot and motivated and I’m gonna make it happen quickly. If I’m like it’s something over here on the side that, yeah I control the asset, big deal. I’m not so motivated, I hate to keep using that word, but that’s the reality. Steven Butala: It’s a good question and it’s a sign that you’re thinking out of the box and it’s good. Jill DeWit: Right, I like that. Steven Butala: Today’s topic; the value of meeting other like kind investors. This is the meat of the show. So Jill and I kind of wrote this topic together because at the end of the week when this airs, we’ll be hosting a live event. The first time event. Jill DeWit: Yeah, first ever, big in-person training here in Los Angeles. I am so exited, it’s gonna be awesome. And I know ’cause you and I … I put a thing on Facebook the other day that we just spent hours, we have spent so much time into this. And we just spent another three hour chunk the other day tweaking the agenda, or yeah, the agenda, even more for the event. And I know we’re gonna tweak it a little bit more. So, I don’t wanna step on your toes. Steven Butala: No, no, go ahead. Jill DeWit: So the value, there’s a couple of things that I jotted down about the value of meeting people in person. So it’s like even just going to a little REI meetup, where real estate investors meet up, a lot of people do that. I’ve seen groups have their monthly, weekly, all kinds of different variations, and I highly encourage that. It is so valuable. Like you said, there’s a lot you can get off the internet and watch and absorb. But there’s time you just need to be face to face and talk to these people. And when you’re face to face and you can ask questions and get immediate answers, there’s just no comparison. Steven Butala: We’re all humans. Steven Butala: Business air travel has never been higher in the history of the planet. And online meetings have never been higher, so there’s still huge value meeting somebody, shaking their hand, getting to know them. And so there’s this human feeling you get like yeah, I’d love to do business with this guy, that you just don’t get online. And I don’t think that’s ever gonna change. Steven Butala: So I’m not plugging our live event at all. I’m just saying there’s a value. So it’s kind of like that and even elevated. Steven Butala: I mean I’ve said this many times over the years doing the show, that learning the real estate part of this, how to buy property and resell it, you can learn that in a weekend if you really sit down and come to us, or come to the environment where you’re learning, with a little bit of experience, it’s the people part of it that really takes you to the moon. For instance, one of the things that happened since we started Land Academy, that I never intended on happening, is people coming just throwing money at us. 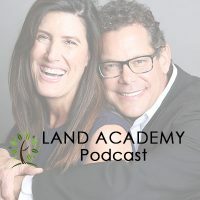 Because if you go back to the cash loan from land program, or Land Academy 1.0, I always have been, my whole life, adamant about spending my own money to create more equity, which kind of ties into that question we just answered. I’d rather buy a lot for $15,000 and sell it for 30, and option it for 25 with my own money. Steven Butala: What ended up happening, over the years with Land Academy now, is people they wanna get involved financially. They don’t wanna learn how to do this, they just wanna give us a bunch of money. And so I fought it. I fought it for a while, but now we do a bunch of partnerships. Several equity partners who I have confidence saying, extremely happy with their returns that they’re getting and the level of information they’re getting from us and all of it. You know another value of meeting other like kind land investors or any investors in a group setting is remember when you were in sports and you played a team that was clearly better than you? Let me start with the opposite. First you play a team hats clearly worse than you, you know what happens? You play down to them. All of a sudden, you’re dropping the ball, you’re making all the mistakes, why? ‘Cause you’re laying to that level. It just naturally happens, for some reason it does. And the reverse is true. So imagine being in a room with really brilliant smart people, and you’re hearing their thought process and understanding. You know what? You’re gonna raise up your game, you’re gonna play up to them and you’re gonna start thinking like them. And then you’re gonna walk away with that knowledge and experience. That’s my thing. I call it like, you play up. Jill DeWit: Well, let me say, I don’t think everybody will. But I hope they do. N, I’m serious. ’cause that would be the right thing to do. Or just even if you pick out somebody … there’s gonna be people in the room that are gonna pick out someone and go, “You know what? That guy is like me, but he’s a year ahead of me. I wanna be that.” So you should seek out that person and follow them around. Jill DeWit: That’s good. ‘Cause you’ll play up to them. Steven Butala: I hope I’m not the smartest person there. And I fully plan on that not happening. We have a lot to learn from our members. And we continually learn from our members in all different vasts of this. So they’re coming up with stuff that I couldn’t even … it’s amazing. You know, and the last point I was gonna say is, meeting other investors in these in-person environments is inspiration, I think, it’s an inspiration to get you to that level too. So you can now … like someone walking in, I can walk in, Steven, I could shake your hand, and I can know what’s possible. I really see what’s possible. You can really tell me in person, “Hey, I was in your shoes too. And here’s what I did.” And 50 deals later, you know? Now I can do this, this, and this. So for me, not at that level, say a person that’s new, I’m like all right, I know it’s possible now. And I can see you’re a real person. Seriously. I can see you’re a real person and I know … you know what? Heck, if he did it, I can do it too. 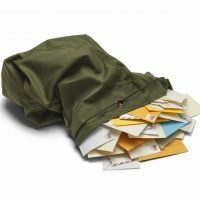 Steven Butala: I mean, Jill had the brilliant idea, and I do mean brilliant, to pay for some of our top paying members to be there to help some of the newer people. Jill DeWit: It’s true. Thank you. Steven Butala: I hope the people who are going to attend this event come with a bunch of questions. He first of which would be, how did you get past X? I’m having trouble with X. How did you get past it? Jill DeWit: And we have a bunch of us in the room there that did do it. Steven Butala: That already got passed it. Jill DeWit: And we’re gonna talk about that stuff. It’s so good. Steven Butala: Well, you’ve done it again. You’ve spent another 15 minutes with us, listening to the Land Academy show. Join us next time where we discuss hands on learning from pros and how it’s priceless. Jill DeWit: So all our sales this week … what’s this week? Jill DeWit: Be there or be square. Steven Butala: Yeah. Or meeting people in person. Jill DeWit: I like mine better. Be there or be square. Steven Butala: It’s be there or be square week. Share the fun by subscribing on iTunes and YouTube or wherever you are listening and watching. And while you’re at it, please rate us there. We are Steven and Jill.